Cumin (pronounced "come in") is the pale green seed of Cuminum cyminum, a small herb in the parsley family. Cumin is also called Comino Romano, Jiraka, and Jeera. Cumin is believed to be one of the earliest cultivated herbs and is native to the Mediterranean and Upper Egypt. From early times Cumin has been cultivated in Arabia, India, and China. Cumin was important for health in ancient Egypt. In Indian traditions it correlates to the fifth chakra, the navel center. In India it can also be tried to help support infant colic. Early Romans used ground Cumin much like black pepper is used today. During the Ottoman Empire, roasted Cumin was often featured in breads of European courts. 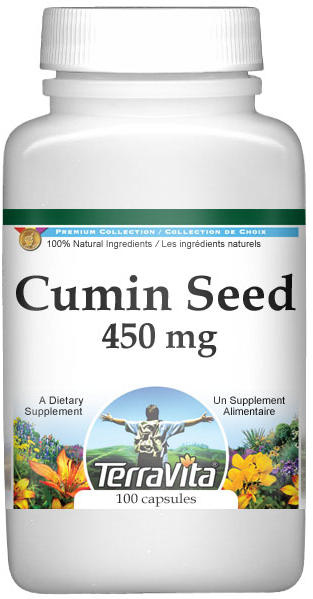 Today, Cumin can also be used by veterinarians. Seeds are added to vegetables, beans, dips, pickles, yogurt, lamb, cordials, and Chinese, Vietnamese, Arabic, Indian, Mexican and Cajun dishes. It is added to lemonade and tamarind water to help avoid stomach problems. Cumin is a popular spice all over the world, especially in Latin America, North Africa and all over Asia. Cumin originated in Western Asia, where it has been cultivated since Biblical times. Cumin is mentioned in Isaiah and Matthew, and in the works of Hippocrates and Dioscorides. From Pliny we learn that the ancients took the ground seed medicinally with bread, water or wine, and that it was accounted the best of condiments. It is a small annual, herbaceous plant, rarely exceeding a foot in height and somewhat angular. The leaves are divided into long, narrow segments like Fennel, but much smaller and are of a deep green color. The flowers are small, rose-colored or white and bloom in June and July, being succeeded by fruit, the so-called seeds, which constitute the Cumin. They are oblong in shape, thicker in the middle, resembling Caraway seeds, but lighter in color and bristly instead of smooth, almost straight, instead of being curved. The odor and taste are somewhat like caraway, but less agreeable. In Malta they call it "cumino aigro," hot Cumin, to distinguish it from Anise, which they term "cumino dulce," or sweet Cumin. Cumin had considerable repute as a corrective for the flatulency of languid digestion and as a herb that can be used for colic and dyspeptic headache. The older herbalists esteemed Cumin superior in comforting carminative qualities to Fennel or Caraway. Cumin can also be tried to help support bloating, cough, diarrhea, indigestion and morning sickness. Cumin has also been found to help alleviate carpal tunnel syndrome and can be used as a natural breast enhancer.